Nutty Birder: Misidentifications: Are They Bad? Many people are very embarrassed when they misidentify a bird, especially when there are other birders around. They may shrug it off and make fun of themselves for it but they really are embarrassed. Few birders will think less of you just because you make a misidentification and if they do you really shouldn’t let that bother you. If you get embarrassed I believe that you miss a great possibility to learn about the bird’s identification. You may misidentify a bird because you didn’t get a good look or you may have seen it at a weird angle but in the end you just misidentified it. Each time this happens you should learn much more than you ever do when you make the correct identification. Every time you see a bird at a different angle you should learn new ways of identifying that bird. The reason that field guides do not always help identify a bird is because they only show one angle of the bird. After birding for a long time you should have a field guide in your head that shows all angles. 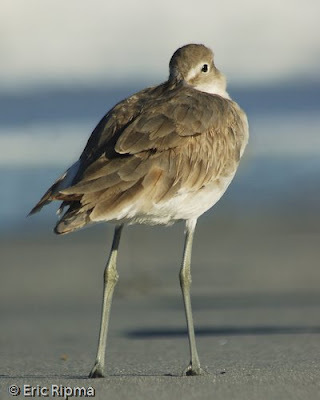 Willet: At this angle you may not be able to tell what this is because the field guides do not show you this angle. The biggest problem when you make a misidentification is when you go on thinking that you were correct. This is the problem with big days and big years. Each of these ways of listing influences you when trying to identify a bird. If you are in between on a bird identification you may just count it as a bird that you have not seen in that time period. If you do this you never really learn which bird is which. Of course big days and I’m sure big years are lots of fun to participate in, you just need to make identifying the bird correctly more important than seeing many species of birds.